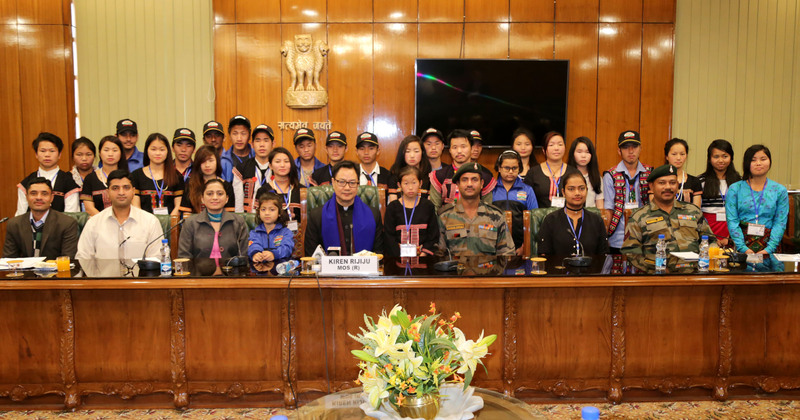 The Minister of State for Home Affairs, Shri Kiren Rijiju with a group of students from Dibang Valley of Arunachal Pradesh attending the National Integration Tour, organised by the 19th J&K Rifles, in New Delhi on December 29, 2017. Delhi: A group of 24 students from Dibang Valley of Arunachal Pradesh attending the National Integration Tour, organised by the Indian Army’s 19th Mountain Division of Jammu & Kashmir Rifles, called on the Minister of State for Home Affairs, Shri Kiren Rijiju here today. The tour is being organized from December 24, 2017 to January 06, 2018 to the National Capital and Agra and Lucknow. Speaking on the occasion, Shri Rijiju complimented the J & K Rifles for organizing the National Integration Tour for giving children from the remote region an opportunity to visit the national capital and other historic cities to discover the grandeur of India. While interacting with the students, Shri Rijiju said that the National Integration Tour is a good initiative taken by the Army since this is the first visit outside the state for a majority of these students. He called upon the children to share their experiences with family and friends back home. He also advised them to do hard work in pursuing their studies and professional carriers. The aim of the National Integration Tour is to promote harmony and awareness. The tour is aimed at integrating the students with the nation and promoting concept of unity in diversity. The students are visiting landmarks like the Taj Mahal, Fatehpur Sikri, Agra Fort, Imam Bara in Lucknow and Rajghat, India Gate, National Museum, Pragati Maidan and Delhi Metro in Delhi.